Specially engineered, yellow-tinted night driving clip on glasses effectively reduce the "blue light" glare from oncoming headlights. Night driving glasses sharpen the contrast and the details around you so you drive safer at nighttime or in haze, fog, rain or snow. Fits prescription eye wear. These were just what I had been looking for. So I got 4 pair, one for each car. They are a life saver driving at night, in the fog, or in the snow. Night driving with the halogin ligths & blue colors hurt my eyes without the use of the yellow clip-ons. They make night driving less stressful on my eyes. Also the yellow tint seems to add clarity like shooting glasses. Really cuts down on bright headlights and street lights. The best part is cutting glare from lights from driver side rear view mirror. This product is unbelievable I was worried because I couldn't drive @ night because of the glare. These glasses took away the glare and they light up the road. It is a great addition when driving in heavy traffic at night. Removes the glare and improves night vision. This makes night driving so much easier. The glare is not there anymore. I would by these glasses again. I bought a pair of these for myself. I think my husband thought I was crazy, until he used them in a snow storm. It's amazing how much better you can see in snow and fog. Haven't tried them in the rain yet. Any way my husband liked them so well I ordered him a pair while ordering he said to get him two pairs so he has them in the truck and car. Almost forgot they work good at night too. I sure would buy them again. Won't do night driving without them. These glasses make night driving so much easier. Cuts down the glare from oncoming car lights. This pair is for Hubby n he's happy. Use for night driving glare. I love the night driving clip ons. I stoped driving at night because the glare of the lights were so blinding to me so much so that I was afried I might get into a car wrick at night. When I saw the price ([$])I order extra and gave them to my family and they love them as much as I do. The night driving clips and glasses would be great as gift ideal for anyone at any age. I decided to try these clip-ons. Wow! I was Shocked they really work. No glare. Everything looks like a bright day, but no glare even in the rain. I am amazed to tell you these really work well. I especially like them because they click on to my regular glasses. I have a pair that you wear over your glasses and they are cumbersome. These are light weight and other than the obvious advantage of cutting the glare they are just great. I don't use these at night because I didn't see the benefit. Use them when driving in the rain and it is the best. Clear vision even while driving in the worst down pours. Solves the glare problem for me. WORK LIKE A CHARM !!! I tried them out before I sent them to her to make sure they worked and almost kept them!! PERFECT FOR DRIVING AT NIGHT!! there overall just great ive looked for months now im happy .I say try try them you will be amazes. I have night vision problems so I purchased these glasses to help improve my problem. And yes I was thinking "These aren't going to help". Well I was wrong, so I brought a pair for my Father and brother who have the same proble as me. they love theirs too. You are buying a piece of yellow tinted plastic to fit over your eyeglasses. As it is yellow, it dulls down the white glare of oncoming headlights and overhead street lights. Doesn't eliminate glare, but does reduce glare. It is no help during daylight sun glare, but it wasn't advertised as such. An unexpected benefit was that it brightened days that were dull and overcast. A disadvantage is that the clips that hold the plastic in place are flimsy and tight, so you have to be careful not to break them while fitting them over your eyeglasses. In addition, the act of doing this leaves fingerprints on your eyeglass lens. So you have to take time to clean your eyeglasses. All in all if you have good vision you don't need them, If you are bothered by glare at night, they are well worth the money. The glaases worked really good. Took the glare away. Ok but need some instructions on how us them. I had mess around with to figure out to use them. Though u figure it, there amazing. These are great for night driving since they cut down the glare of on-coming headlights and of bright street lights. Could fit a little bit better or have more "Styles"
Had to buy the clip ons because I can't drive without my prescription glasses. Haven't yet tried them at night, but they definitely help in the rain! Had to drive at dusk in the rain, and these really brightened things up. The one-size clip ons weren't a perfect fit, but worked OK. I clip them on my regular glasses for driving. Without them, oncoming car lights are so terribly bright and glaring, that I can barely see the center line, and the right edge of pavement, whether I'm driving, or a passenger. When I'm driving at night the lights no longer glare off my glasses and I don't have to squint. They are big and don't look to good on me but no one can see me at night so that doesn't matter. I use them for all my night driving. Although the tint is excellent, they are a bit too big for people with smaller glasses. I have retinitis pigmentosa (eventually results in night blindness). Thought I would try these for night driving as they weren't too expensive. They worked better than I would have thought possible. Reduces glare and increases visibility. Not half bad sun glasses too. Well made clip ons are useful with night driving. Great for helping drive because of glare and headlights. Many people wear small framed glasses, and these are too large to clip on comfortably. Hope you can eventually make them in another size. they work great for splash up and rain and fog and snow. they are too big and hit your face so they barely clip on to your glasses. I think I'll order some glasses that go over your glasses. will be more comfortable. The clip ons are lager than they looked in the catalogue. I bought 4 pair but can't wear them. My husband can use them and he likes them. The concept is great, but the connecting clip is difficult to use. These are only ok. Should be stronger to block more glare. I wanted the glasses for night driving! they were no help at all, I did better without them! Bought as a gift for someone and for myself. I found it just made everything yellow and didn't really help with night driving that much. Unfortunately the size of the glasses were not in the ad and didn't fit my normal size glasses. They would only be good for small glasses so I had to get rid of them. So I lost the cost. Purchased glasses for night driving; there were no difference. Don't waste your money! and I just wasted my money. I didn't realize how big they were going to be. I guess I should have known that since my glasses are small I can't get clip ons. So unless you have BIG glasses save your money. I have plastic frame tri-focal glasses, primarily because they are more comfortable to wear than wire frame glasses. 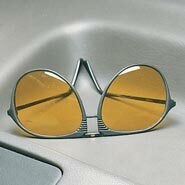 I saw the clip-on version of these night driving glasses and thought I'd found what I'd been looking for ... I could wear the clip-ons and still be able to read something, when necessary, without removing the clip-ons. I was VERY disappointed that the clip-on version does NOT fit on my plastic frames, and I'll have to return the clip-ons and keep searching for something similar so I can still have my tri-focal glasses on for reading, when necessary. Too large. Poor vision in some situations. The lens size is way too big. It does not fit today's glasses. It is for old folks glasses. Metal clips are too distracting. The item was not sent or billed. I have a hard time driving at night because of oncoming headlights. Hope these help. Do not like driving at night. Used to have similar a long time ago and decided to try again. I believe they will make night driving safer for me. To improve driving at night due to glare from other cars and rain clip on serve my purpose! I do the night driving and I hope these help with the glare. I chose this in hopes of seeing better when driving at night. I chose this to improve night driving. DUH, because I drive at night! I need anti-glare glasses for night driving. Reviews were positive, low price. I am 77 years old and drive. I have many elderly friends who drive too. I give this night clip on. Seattle has many gloomy days daytime so cars put on headlights and LED bulb these days so light really strike our eyes. I am informing many friends to order too, not only elders but young friends too. They work better than the over-your-glasses style. Been trying to find these for quite some time . Having a real hard time driving at night now, the new headlights on cars are way too bright, going to try these clip-ons....hope they work! I NEED THOSE FOR CLOUDY DAYS WHEN IT IS STILL BRIGHT. These glasses are advertised to reduce glare at night. Wanted to try. Headlights starting to bother me. I have to do some night driving.These make it safer. I have been looking for these for a long time. I was happy to see them in your catalog. Have a night driving issue. Thought this might help. what do the clipons measure? BEST ANSWER: Thank you for your question. The glasses are 5 1/4 wide, each lens is 2 1/4 high by 2 1/3 wide and less than 1/32" thick. We hope this information will be of help to you. BEST ANSWER: I was unable to see any improvement through these and, in any case, they are made for a larger face. I couldn't drive with them for needing to hold them on my face. Do hope someone comes up with a good solution. Thank you for your question. Each lens is 2 ¼” high x 2 1/3” wide and is less than 1/32” thick.We hope this information will be of help to you. BEST ANSWER: Thank you for your question. For our standard delivery it will arrive to you in approximately 5-7 business days. We hope this information will be of help to you. 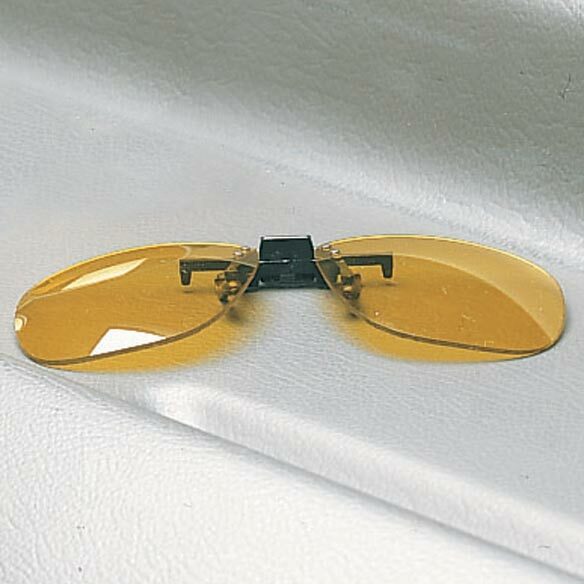 Are the clips rubberized to protect prescription eyewear and not scratch prescription lens? Does it work on wire frames? BEST ANSWER: It works on my wire frames. what size glasses do they fit? BEST ANSWER: Thank you for your question. These will clip onto any glasses.We hope this information will be of help to you.